I left Johannes’ home bound for breweries and hop fields. My second day of riding (the map of my full route is in Part 1) would take me past De Dolle Brouwers and De Struise Brouwers before having a rest at In De Vrede, the café of Sint-Sixtusabdij, and finally coming to Brouwerij Sint-Bernardus where I would spend the night in the heart of the hop-growing region of Belgium called Poperinge. Unfortunately the first two breweries only open up their taprooms and tours on weekends, but as Johannes said before I pedaled away, “You never know – maybe they’ll see your cycle and the rain and feel sympathetic.” With that hope, I headed in the direction of Esen. I rode up alongside the yellow van, feeling even more hopefully seeing the front door cracked open. I knocked and poked my head in. It looked like a brewery – cavernous with cement floors studded with drains and supporting various vats and towers of stainless steel. I shouted out a “Hallo!” and heard someone reply and start walking from a distance. An older man poked his head out from around a door. I explained that I knew they were closed, but that this was the only day I could come by. Before I could explained further, the man said something along the lines of “Nope!” or “Not today!” and pointed me back out the door. At first I felt like this was a bit rude, but at the same time I suppose it’s a bit rude to knock at the door when you know a brewery is closed and then start asking for favors in a foreign language. 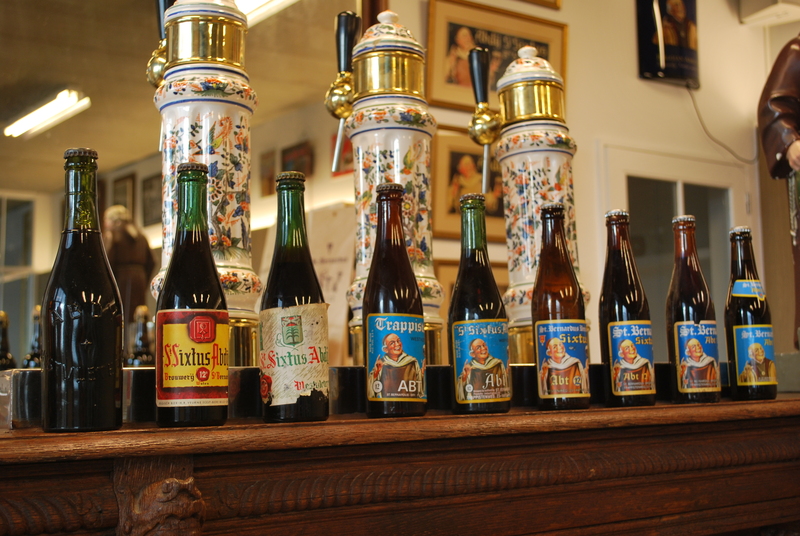 Nonetheless, I was undeterred from trying the same at Struise. I knocked on the door of the old schoolhouse that fronts the brewery, but the building looked vacant and I couldn’t see anyone in the lot in back through the windows. The paint was peeled and one of the windows busted out in one corner, leading me to take a walk around the block just to make sure I was at the right place. I managed to pick up a couple bottles across the street at Het Molenhof, a café that stocks plenty of their neighbor’s efforts. They couldn’t sell me the beer I was most interested in, Aardmonik, because they only had one case left and word was that it wouldn’t be brewed again until October, but they were happy to sell me another oud bruin called Ypres. 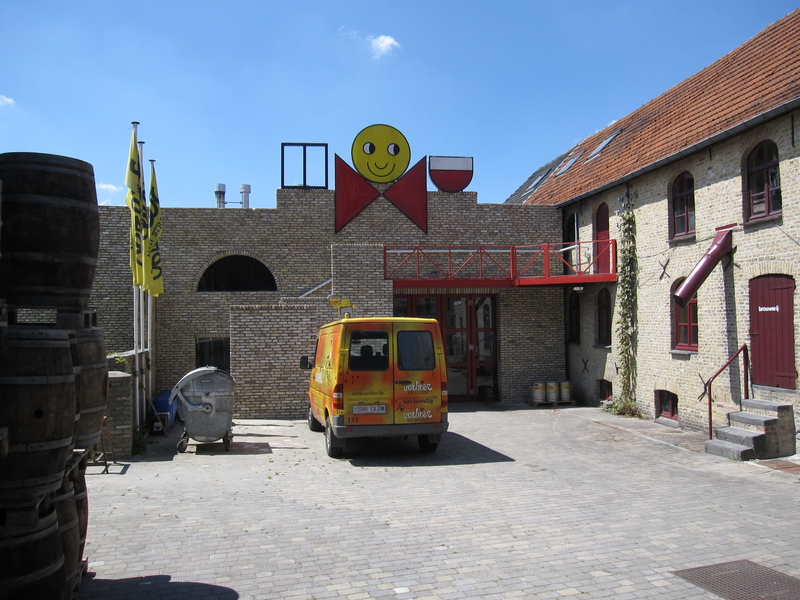 The bartender gave me a tip that I might have luck finding Aardmonik at the Brouwerij Deca, but the route I had plan was going to hook me around Deca. Based on how hungry I was and my penchant for running out of time for all my planned stops during my cycling, I wasn’t eager to take a detour of a few miles. And besides, by this point I was already forming the notion in my mind that I would probably have to come back to Belgium to pick up on what I had missed. Propelled by the smoldering in my stomach, I quickly cycled the remaining few miles to In De Vrede, the café operated by Sint-Sixtusabdij and the only (legitimate) outlet available to me for purchasing Westvleteren 12. I took a seat, ordered the 12 and a sandwich. Seeing the line grow at the gift shop, I abandoned my table to buy my beer as soon as possible. When I came back, my order was waiting for me. Johannes had told me over the beer we shared that I might be surprised at how different the beer tasted at the café, and that the locals are quite certain that the beer sold out of the Abbey and out of the café are not the same. He didn’t elaborate, but he certainly seemed right – the beer I drank with my sandwich was boozy and lacked the liveliness and depth of flavor of the aged bottle. I thought that probably the difference was due to a lack of aging. It was not a bad beer, but not a great one either, and it made me slightly disappointed that I hadn’t ordered the blonde to get a better feel of their range. I would be very surprised if Johannes was right and the monks are operating such a devious scheme. It would be somewhat deceptive and dishonest but also it would introduce unnecessary complexity into their brewery. It is always harder to brew two types of beer than a greater volume of one type. While I was able to secure myself a six-pack, more of my interests moved from the day’s itinerary to one of a future visit. Westvleteren has many woods and walkways surrounding the Abbey that I had planned to spend time exploring, but my appointment for a brewery tour at Brouwerij Sint-Bernardus was fast approaching, so the only activity I had time for was a quick peak into the Claustrum the brothers designed to share aspects of their monastic life with the public. Perhaps in that future day, I’d even be able to stay for a few days at the brothers’ guesthouse and experience their life of prayer and quiet contemplation. And so I very hastened in very un-monastic fashion through the increasingly beautiful region of Poperinge, home to Belgian hops. 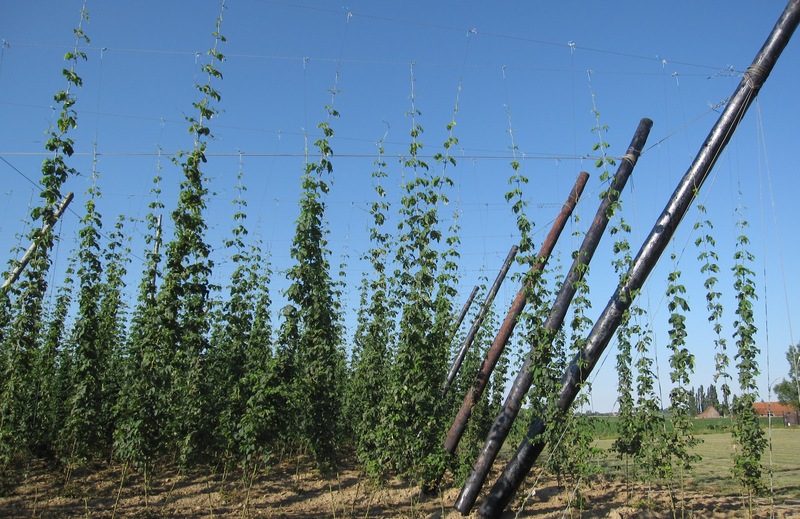 The hops climbing enormous poles and along a network of wires gave the impression of fortresses bursting with ivy, standing as much as ten meters high and covering significant acreage. And standing opposite these fortresses were soft, swaying fields of barley, fuzzy heads bobbing under the breeze. After checking into my digs for the night nextdoor to the brewery at the beautiful Brouwershuis, I jogged over to the brewery just in time for a tour. I formed part of a small English-speaking group along with a British couple and another from Nashville, Tennessee. Sint-Bernardus used to brew as Sint-Sixtus, producing the beer for the brothers of Westvleteren since the end of WWII, but since 1992 they’ve had to brew under their current name, taken from a nearby defunct abbey that produced cheese and is linked to the history of the current brewery via land changing hands and business changing direction. However, it’s Sint-Bernardus that still brews with the original Sint-Sixtus yeast, as the brothers no longer wanted to coordinate with the brewing university in Leuven to periodically refresh their culture. Westvleteren is now brewed with yeast from Westmalle, while Sint-Bernardus hoofs it to Leuven. It was nice to be around some other beer-travelers for awhile. We swapped recommendations of beers and our favorite parts of Belgium while relaxing with St. Bernardus tripel in the wood-paneled taproom. I even learned that the couple from Nashville, Chris (who used to homebrew) and Hellen, would be visiting Cantillon in Brussels the same day I was planning to go. Chris said they’d already visited once but he was eager to spend more time there. Meanwhile the couple from Britain told me of memorials and museums of British war history in Poperinge and outside Ieper. It so happened that those spots were my next planned stop. This entry was posted in beer, travel and tagged Belgian, Belgium, cycling, De Dolle Brouwers, De Struise Brouwers, Flanders, narrative, Poperinge, St. Bernardus, Watou, Westvleteren on June 13, 2014 by Dylan Bargteil.